Holly joined the Viren team in August 2016. 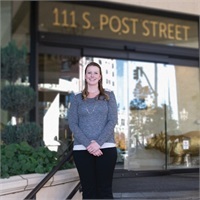 She started as the Administrative Assistant – Financial Services where she currently assists Paul and Mike with the preparation of client portfolio reviews, creating new accounts, completing various client requests and special projects. Holly obtained her Life & Health Insurance License in 2012 and worked with the senior markets where she sold Medicare Supplements and Medicare Advantage Plans. She developed a passion for helping seniors find the most appropriate plan to fit their needs. With her recent career path change in Viren and Associates, Inc. she plans to work towards achieving her securities registrations in the near future. Holly was born and raised in Spokane where she met her husband in 2006 and started a family. She stays busy with her two kids and spending a lot of family time exploring the outdoors, riding bikes, fishing and hiking. One of Holly’s favorite hobbies where she can go and relax is practicing hot yoga. You can reach Holly by emailing her at [email protected] or by calling our office at (509) 462-0747.